to Speech by Ambassador Thomas A. Shannon Jr. I have the honour, as Chairman of the Board of the Lakshman Kadirgamar Institute for International Relations and Strategic Studies, to introduce a very special person who is in our midst here today, our guest speaker, Ambassador Thomas A. Shannon Jr. Ambassador Shannon is the senior-most career United States Foreign Service Officer and just the 14th in history to rise to the role of Under-Secretary-of State for Political Affairs. In December 2013, Secretary Kerry appointed Ambassador Shannon as Counselor of the Department, only the 7th Foreign Service Officer to hold the position of Counselor since World War II, and the first in 32 years. From 2003 to 2005, he served as the special Assistant to the President and Senior Director for Western Hemisphere Affairs at the National Security Council. This is just a glimpse of the vast experience that Ambassador Shannon brings to his job. I am sure that to all the staff at the Department of State, it must truly be an inspiration to work with someone so knowledgeable and with such rich and broad experience. As you all know, this has been a milestone year in US – Sri Lanka relations, and Ambassador Shannon’s visit follows a series of important visits from the US including two members of President Obama’s Cabinet: the Secretary of State, H.E. John Kerry, and Ambassador Samantha Power. You would recall that Secretary Kerry, during his visit in May this year, announced that the US and Sri Lanka will establish a Partnership Dialogue. At our discussions on Monday evening, Ambassador Shannon and I decided that the Partnership Dialogue will be launched in Washington DC in February 2016. This is a remarkable development in relations between our two countries that will institutionalize the renewal of our centuries-old friendship. And I am happy that our Partnership Dialogue will benefit from Ambassador Shannon’s wisdom and experience. “The Partnership between Sri Lanka and the United States” is what Ambassador Shannon has chosen as the topic for today. I know that all of you hear me often almost on a daily basis on television and radio and read what I have said sometimes quoted correctly, and sometimes wrong. 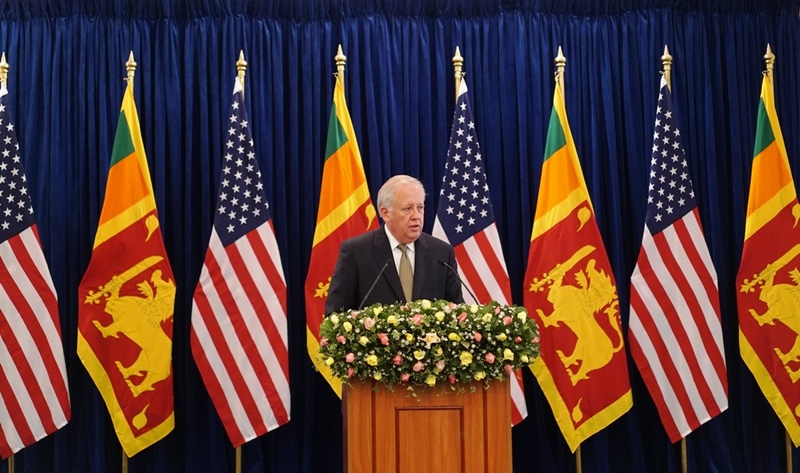 I will spare you now from having to listen to me further and invite our guest speaker, Ambassador Thomas Shannon to speak to you on ‘The Partnership between Sri Lanka and the United States’. I am sure that his thoughts will be a precursor and a guide to broadening and deepening both people-to-people contact and government-to-government relations between our two countries. Ambassador Shannon, the floor is yours……. at the Lakshman Kadirgamar Institute of International Relations and Strategic Studies. Good morning, and to all of you Ayubowan, Vanakkam. Thank you for being here. It’s a tremendous honor and a great pleasure to be here today. Thank you, Mr. Minister, for your very kind introduction. To be at this respected institute, named in honor of the late and great Lakshman Kadirgamar, and an institute dedicated to the study of Sri Lanka’s strategic interests, is the right place to be today to talk to all of you, about the partnership between the United States and Sri Lanka. Few understood the strategic interests of Sri Lanka better than Kadirgamar, who was an accomplished international civil servant, and an unparalleled expert on foreign affairs – appointed three times as foreign minister. It has been nearly 10 years since his assassination, but his vision of a united, inclusive, and peaceful Sri Lanka is becoming more real by the day. But your nation’s journey down that long road is well underway. In January, and again in August, the world witnessed your resolve to move beyond the acrimony of the past and towards a future that is inclusive, peaceful, just, democratic, and prosperous. Sri Lanka is an example of the power of citizens to reinvigorate their democracy, to retake control – through the ballot box – of their country’s trajectory, and to set a course to a brighter future. We now look to Sri Lanka to also provide inspiration to others around the world, to show them how justice and compassion can overcome a difficult past and help create a stable and prosperous future, and strengthen a nation’s security, prosperity, and prestige. The United States wants to see a strong Sri Lanka, one that is a leader in the international community, contributing to the global economy, promoting human rights, justice, and democracy abroad, and helping to uphold international law. With its entrepreneurial people, abundant resources, and strategic location, Sri Lanka is uniquely positioned to do so. Indeed, this beautiful building’s history is itself a reflection of Sri Lanka’s strategic position: before being transferred to the Ministry of Foreign Affairs by the Sri Lankan Navy, it was owned by the British Board of Trade and then housed a branch of the Imperial Lighthouse Service. And the maritime importance of Sri Lanka, as you know, stretches far back into history. Ships from ancient Greece, Rome, Arabia, and China sailed through Sri Lankan waters and docked at its ports. Yesterday, I was in Trincomalee and took a tour of Fort Frederick, which the Portuguese built nearly 400 years ago, and which was long a site of strategic rivalry between European powers. The Portuguese soon lost it to the Dutch, and it then changed hands with the French several times before the British captured it in 1795, fortifying and defending it through two World Wars until 1948, the year that Sri Lanka gained independence. Trincomalee is still one of the world’s finest natural deep-water ports, and its beautiful city has tremendous growth potential. I would add that I also visited the Temple at the top of Fort Fredrick and I was struck by the power of faith and the resilience of faith. One that overcame the years of conquest and subjugation and showed the ability of the Sri Lankan people through its faithfulness. Let me put it this way – it was humbling for me to be in such a place and recognize that a commitment to a faith was at the end of the day able to overcome so many years of conflict. While I was in Trincomalee, I also toured an ice factory that’s partly funded by USAID, and helps small-scale fisherman preserve their daily catch. But before it had factories to make ice, Sri Lanka had to import it. And, believe it or not, it was in the early 1800s that an entrepreneur from Boston, Massachusetts, started shipping blocks of ice – cut from frozen New England ponds – all the way to Colombo. In fact, our countries have a long and fruitful history of commercial relations, going back centuries. As far back as 1789, whaling and merchant ships from the United States began to visit Sri Lankan harbors. By the end of the 19th century, U.S.-Sri Lankan trade ties were thriving: we imported goods like pearls, graphite, and tea, and exported glassware, kerosene, and medicine. Today, the United States is Sri Lanka’s largest single-country market, accounting for over 20 percent of your exports in 2014, worth nearly two and a half billion U.S. dollars. As I flew into Colombo two days ago, I saw below me the busiest port in South Asia and one of the top 30 in the world – an operation that moves over five million containers every year. And that number, I predict, is only going to go up. Your nation sits at the crossroads of Africa, South Asia, and East Asia. By the middle of this century, economists predict that Asia will account for 50 percent of the world’s GDP. Over the next few decades, the supply and demand generated by the billions of people who call this region home will become increasingly central to the world economy and to global stability. We share your vision of Sri Lanka as a hub for trade and investment, and support this effort through our Indo-Pacific Economic Corridor initiative. Our wonderful U.S. Ambassador here, my good friend Atul, has recounted to me his amazement at seeing, from the old Dutch fort in Galle, the countless ships that sail past Sri Lanka along the sea lanes between the Straits of Hormuz and Malacca. Forty percent of all seaborne oil passes through the former, and half the world’s merchant fleet capacity sails through the latter. To put it simply, stability and prosperity of the entire world is dependent on the stability of these vital energy and trade routes. And Sri Lanka is at the center of this. Through your relationships with other nations and active engagement in multilateral organizations, including, for example, the Indian Ocean Rim Association – where, it’s worth noting, Minister Kadirgamar once held a position – you can help lead regional efforts to strengthen economic ties and support maritime security and safety. In the decades ahead, the economics, politics, and security of the Indian Ocean region will be a central focus of the world. We are hopeful Sri Lanka will continue to contribute to the development of a regional consciousness – one that promotes the values of democratic governance and respect for human rights, freedom of navigation, sustainable development, and environmental stewardship. You have already accomplished much: ratifying the UN protocol to combat human trafficking, as well as supporting civil society through your voice and vote at the U.N., and, importantly, agreeing to host next year’s Asia-Pacific consultations for the Special Rapporteur of the UN Human Rights Commission. By these actions, you have demonstrated a commitment to improving human rights not just within Sri Lanka, but throughout the world. Your military has also demonstrated regional leadership – you were one of the first nations to arrive in Nepal with critical relief supplies after its terrible earthquake this past April. Members of your Engineering Corps cleared several kilometers of roads, allowing for ambulances and relief materials to reach areas devastated by that disaster. The need for these efforts will only increase as your region grapples with the impact of climate change and an increase in extreme weather events. 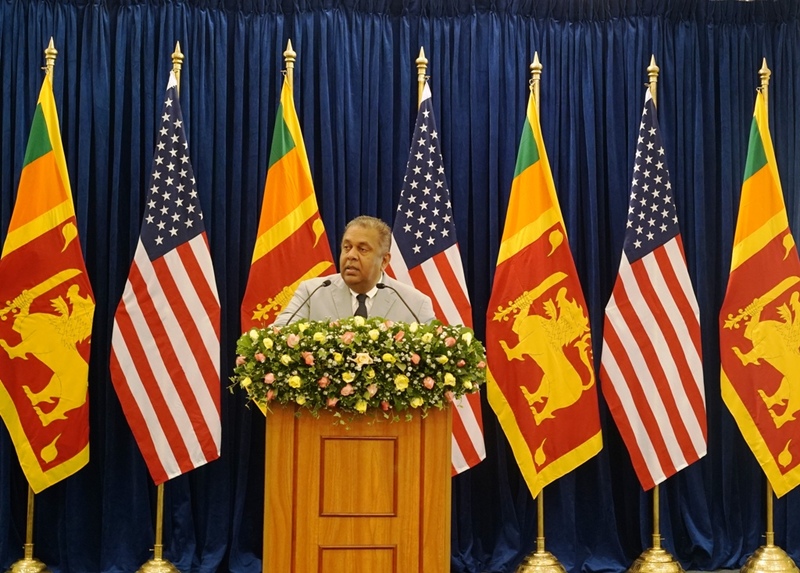 The United States looks forward to working with Sri Lanka to help strengthen our abilities to provide humanitarian assistance and respond to natural disasters. Your armed forces are also stepping up to contribute to global security challenges, sending peacekeepers to some of the world’s toughest spots – including Lebanon, the Central African Republic, and South Sudan. We welcomed President Sirisena’s pledge of several additional vetted battalions at the recent peacekeeping summit of world leaders, and we look forward to working with you to ensure future participation reflects the best of Sri Lanka’s professionalism and honor. The United States welcomes all of these efforts, and we believe that your armed forces can also play a constructive role in ensuring a bright future. As the resolution that we co-sponsored at the Human Rights Council stated: “a credible accountability process for those most responsible for violations and abuses will safeguard the reputation of those, including within the military, who conducted themselves in an appropriate manner with honor and professionalism.” We strongly support these statements, and are willing partners to help you implement them. As Secretary Kerry and Ambassador Power both made clear during their visits to your country: we have long worked with Sri Lanka to help it further strengthen democratic institutions, reconcile multi-ethnic and religious communities, and accelerate economic growth. We are now working to expand trade flows, increase foreign direct investment, and, together, show the world the bright possibilities of Sri Lanka’s future. We are forging partnerships with the private sector, especially in under-developed regions. We are supporting small- and medium-sized enterprises in creating jobs, promoting investment, and improving the business climate. Those initiatives help provide the financial assistance, tools, training, and market access that can help bring economic stability to all Sri Lankans, including war widows, the disabled, resettled families, and ex-combatants. We are working with Sri Lanka’s economic ministries to help ensure competitive and transparent procurement processes. We are helping to improve law enforcement capabilities and support anti-corruption task forces that seek to uncover and prosecute large-scale financial fraud, breach of trust, misuse of public funds, and money-laundering crimes. The partnership between Sri Lanka and the United States continues to grow, and with Sri Lanka’s continued progress, we plan to expand and strengthen our relationship in the years to come. In fact, one big reason I came here this week was to spend some time with my friend, Minister Samaraweera, who, to my great honor, will lead Sri Lanka’s participation for the first U.S.-Sri Lanka Partnership Dialogue. When we meet for this dialogue in February in Washington, D.C. – and I am sorry about that sir, it is the coldest time of the year – our discussions will be organized around four main pillars. First – governance, development cooperation, and people-to-people ties. That will include everything from steps on justice and reconciliation to educational exchanges. Second – economic cooperation, including topics like women’s empowerment, investment climate, and clean energy. Third – security cooperation, in particular peacekeeping and security-sector reform, to support Sri Lanka’s military preparedness to address current and future challenges. And fourth – international and regional affairs, including efforts to combat climate change and ensure maritime security. As we continue planning for this inaugural dialogue, both the Foreign Minister and I will have much more to share with you about the details and what we hope to accomplish. But as you can see, our partnership spans virtually all fields of endeavor, and the people of both our nations can expect to reap the benefits. After having seen the tremendous potential of this island nation, I know that the future holds great promise. The United States will work with you to achieve that promise – we are with you as a fellow democracy, as a longtime friend, and as a strong and dedicated partner. Across my 31 years in the United States Foreign Service, I have worked in many countries in transition. From Central America, to Colombia to South Africa, I have seen countries grapple, with the kind of conflict Sri Lanka has faced. I have seen these countries grapple with the problems of reconciliation, of transitional justice, of social and economic development. I can tell you that while Sri Lankans look out into the world and try to find examples or experiences that might be relevant to Sri Lanka, I can assure that your success here will make Sri Lanka a reference point for the rest of the world. And for those countries that are facing conflicts today, in the Middle-East, in Africa and elsewhere, if you get deeper into this century and people look for a model of reconciliation, when people look for hope in dark moments, Sri Lanka will be the point of reference. What you are dealing with here has global consequence. I recognize that it is important to Sri Lanka, I recognize that it is a work in progress, I recognize that there is much to be done but I can assure you the solidarity of the world with Sri Lanka is strong, the solidarity for the United States with Sri Lanka is strong. We want you to be successful, for your own benefit, for our benefit and for the benefit of the world. So I congratulate you all, I thank you for your patience today and listening to me and I am delighted to be here and I look forward to coming back.